You woke to the sound of rain on the roof this morning in Hvolsvöllur and Eyjafjallajökull was hidden beneath a thick layer of cloud. Luckily this town is not just famous for outdoor adventures. Hvolsvöllur also has an amazing museum. You spent the morning exploring the volcano exhibition and Ben took you on a geological journey of discovery. You began 100 kilometres below the surface of Iceland where you could see how the mantle plume rises up beneath Iceland creating a hotspot. This mantle plume powers volcanic activity in Iceland. Then Ben took you back in time to show you how Iceland formed. You could see in the animation that the mantle plume has not shifted but the Earth’s crust above it has, due to plate tectonics. The world’s continents were once joined, then they drifted apart as the plates moved. The Eurasian and North American plates moved until they were over the mantle plume and this is when volcanic activity created land that eventually became Iceland. You can see this 65-million-year process in the video. Back at Midgard Basecamp you met Thor who works here. Thor was in Hvolsvöllur during the 2010 eruption of Eyjafjallajökull (pronounced Aye-a-fetla-yo-cult). The eruption began with lava erupting from a fissure. Then two weeks later a much more explosive eruption began under the glacier. This sent ash billowing into the sky and caused flash floods as the glacial ice melted. 800 people were evacuated to avoid these much-feared floods. Lahars buried farmland below and the roads were cut to allow floods to pass through without destroying bridges. 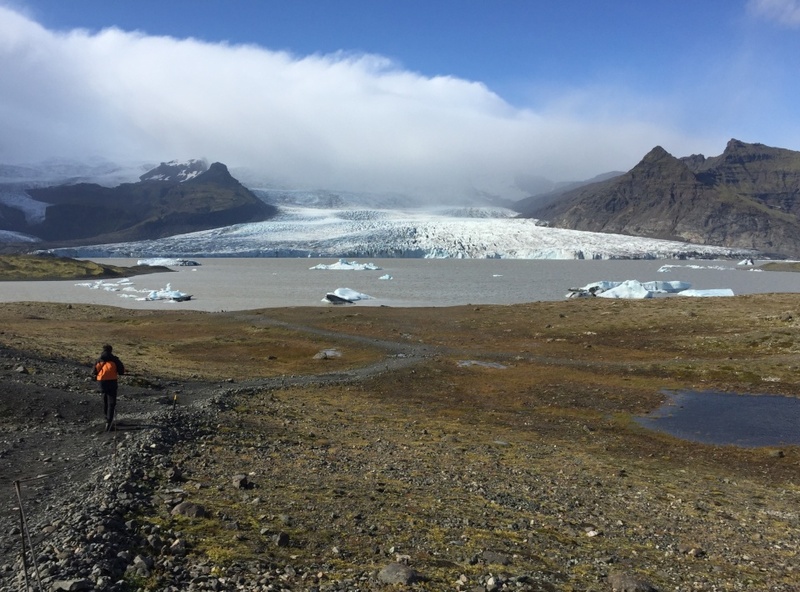 It sounded like a frightening experience, but Thor didn't think so - Icelanders are tough! Thor explained that the Eyjafjallajökull eruption was small by Iceland standards and Katla is a much more feared volcano. Thor talked about the spread of ash. For three days the sun was hidden, and it was like night. The ash felt like sand in your mouth and everyone had to wear face masks. Luckily no one was killed in the eruption which lasted 3 months. Farm animals had been moved inside but many animals died from breathing in the poisonous gases. Some people also suffered breathing problems after the eruption. You can find out more about Thor’s experience by watching the video. The eruption of Eyjafjallajökull closed airports all over Europe leaving millions of people stranded for eight days. This made world news and now tourists flock to Iceland to see volcanoes and enjoy the dramatic landscape. 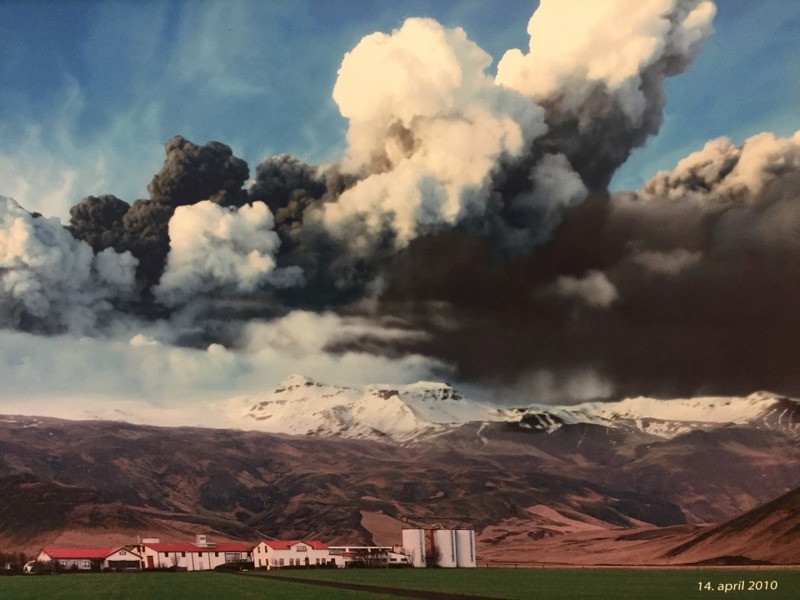 Volcanic ash brings many problems, but it also fertilises the land so despite the problems volcanoes cause many Icelanders seem happy to be living in their shadow. Generations of families have shared their experiences and taught resilience to natural hazards. One of the main lessons we can learn from Icelanders is not to forget about what has happened in the past. We can learn from past disasters to ensure we are better prepared for what may happen in the future. Ben was keen to hunt for ash from the Eyjafjallajökull eruption. He took you to the base of Eyjafjallajökull, but he couldn’t find any ash. Ben was determined, so rather than giving up he asked the owners of a local farm. They took one look at our rental car and said that there was no way we could get to the area where there are ash deposits. Instead they very kindly drove us up the valley in their 'super jeep' to a sheltered spot where ash is still visible. Ólafur dug beneath a grassy area to reveal a thick layer of fine, black ash. Ben was so excited to find evidence from the eruption and dug down to see how thick the layers were. It was surprising that this was the only area where ash could be found given how recent the eruption was. Ash can quickly blow away or be washed away by rain. Ash layers are used by volcanologists as evidence of past eruptions. Ben believes that we probably don’t realise just how often some volcanoes erupt because the evidence can quickly disappear. You can watch the video about this. On Saturday you completed the nine-hour drive north from Hvolsvöllur in southern Iceland to Mývatn in the north. It was hard to drive with all the amazing scenery. You managed to stop at several waterfalls and glaciers along the way and admired the endless volcanic cliffs that lined the east coast. You could see why over 2 million tourists come to Iceland every year! Tomorrow you will have a chance to explore and hike up another volcano. 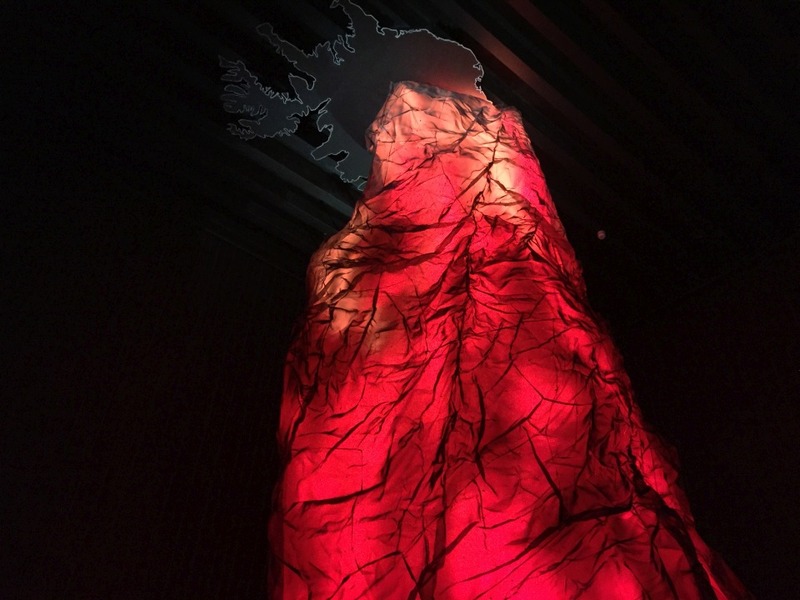 Looking up at the magma plume under Iceland at the Lava Volcano Exhibition. Image: LEARNZ. 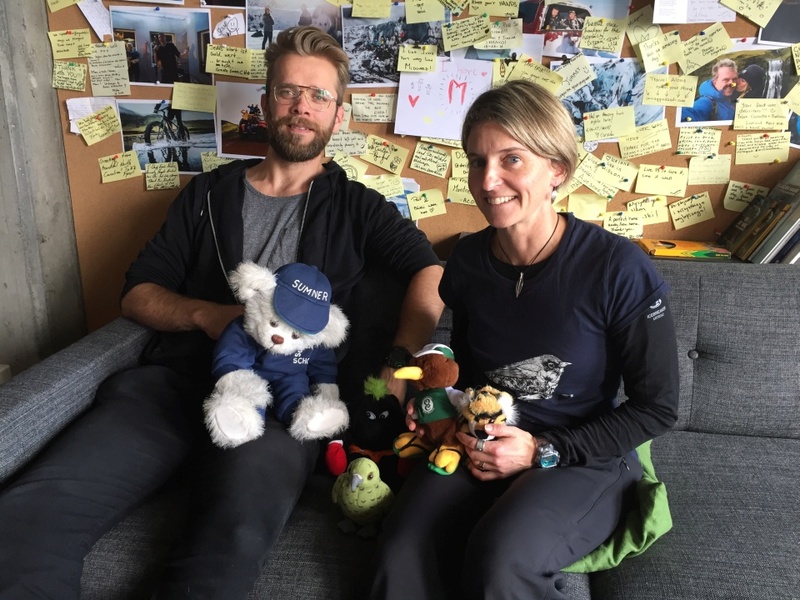 Shelley and the ambassadors hear about Thor's experience of the Eyjafjallajökull eruption. Image: LEARNZ. This photo shows the ash cloud from the Eyjafjallajökull eruption. Image: Gestastofan Visitor Centre. 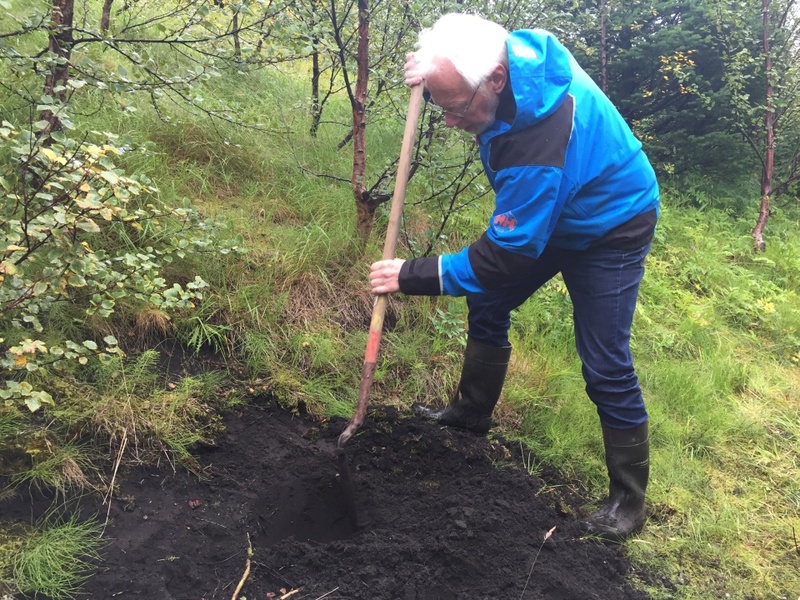 Ólafur owns a farm under Eyjafjallajökull and he shows you some ash from the eruption. Image: LEARNZ. 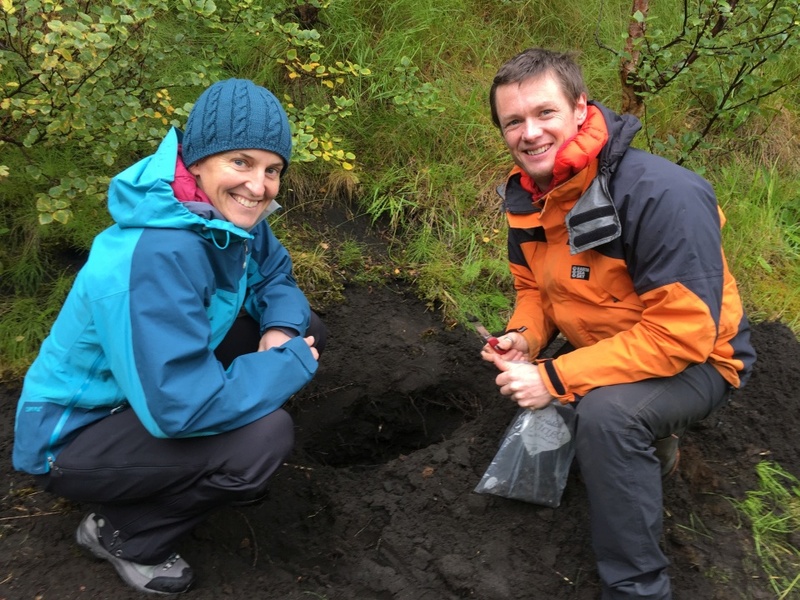 Shelley and Ben collect some ash from the Eyjafjallajökull 2010 eruption. Image: LEARNZ. 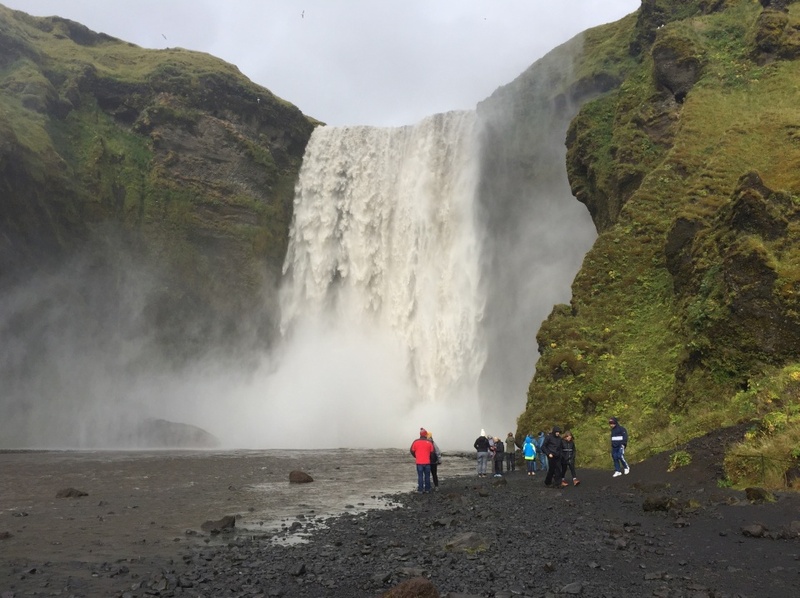 You visited Skógafoss, a 60 metre high waterfall in southern Iceland on your trip north. Image: LEARNZ. 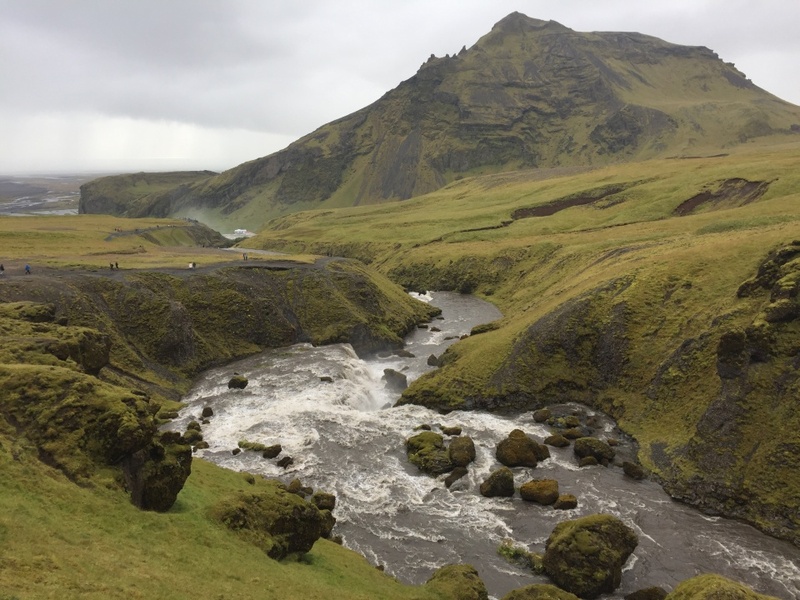 This river feeds the Skógafoss waterfall and it was brown with the heavy rain. Image: LEARNZ. You spotted many waterfalls on your way north. 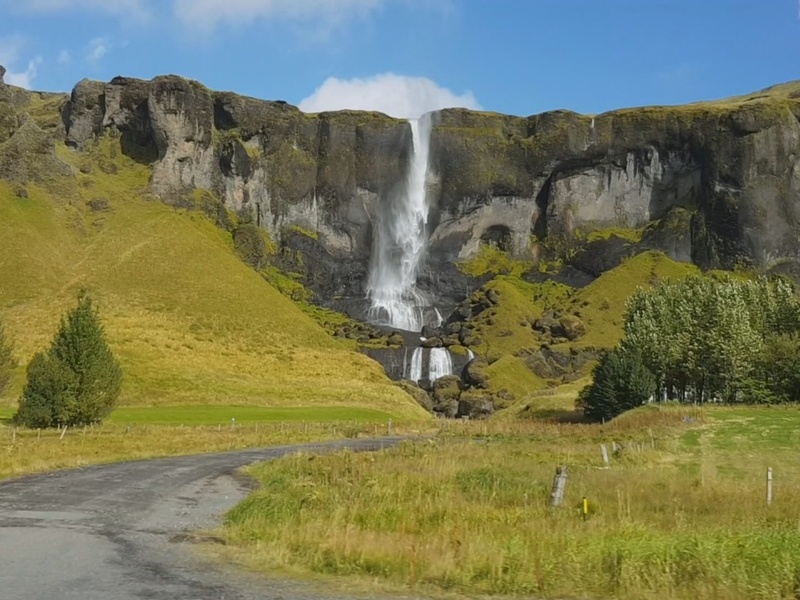 Why do you think Iceland has so many waterfalls? Image: LEARNZ. 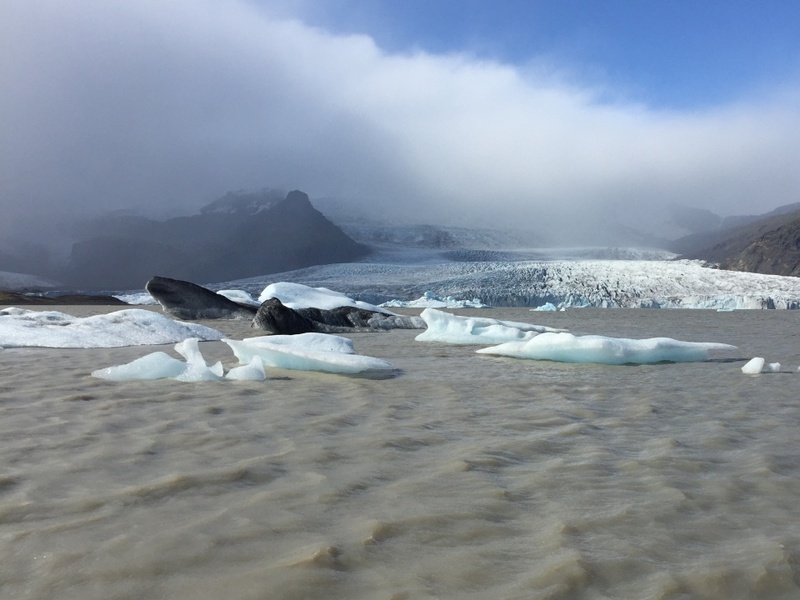 During your nine hour drive north you visited one of many glaciers that extend down to sea level on the eastern coast of Iceland. Image: LEARNZ. Icebergs floated on the terminal lake of Fjarllsarlon glacier. It was a shame not have more time to explore! Image: LEARNZ.